The Royal Wedding of Ms. Meghan Markle and Prince Harry was worldwide news that really was so exciting to watch, especially being in the wedding industry myself! When the news first broke of the engagement I started thinking about how we at The Plaza Hotel were going to celebrate! What unfolded was pretty incredible. Rachel Jo Silver first contacted me in December of last year with an idea to host a Royal Wedding viewing party! We then looped in the talented Ariana Swerdlin and Maureen Farley from The Plaza’s PR and Hospitality events team! After months of planning and brainstorming, the Royal Wedding Weekend arrived! 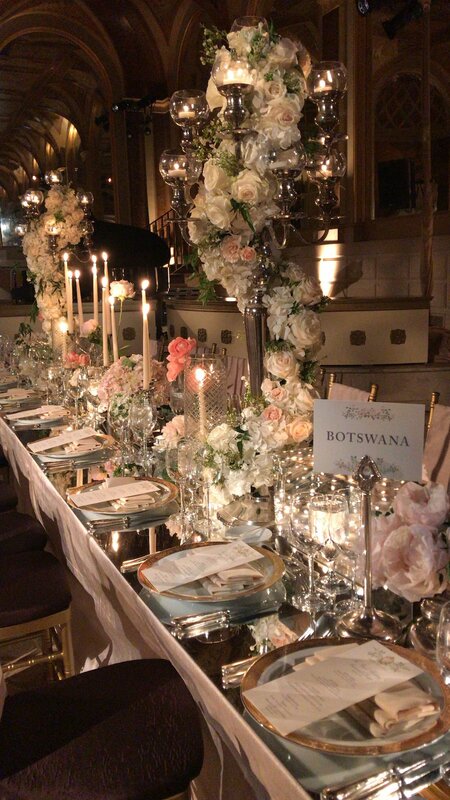 On Friday, May 17th, The Plaza hosted over 90 bloggers, influencers and press to come to The Royal Wedding Rehearsal Dinner. Guests started the evening in of course The Royal Suite in the hotel and were treated to Krug champagne and afternoon tea inspired canapés alongside some really cute activities! Kleinfeld's had setup a Tiara Bar so guests could really get into their inner Duchess spirt! There were even Corgies to play with that are the same dogs that the Queen calls her own! Andre Maier who is a photographer set up a royal portrait station and took photos of all the guests in the same style of Cecil Beaton who shot many of the English Royal portraits! The guests loved every minute of it! 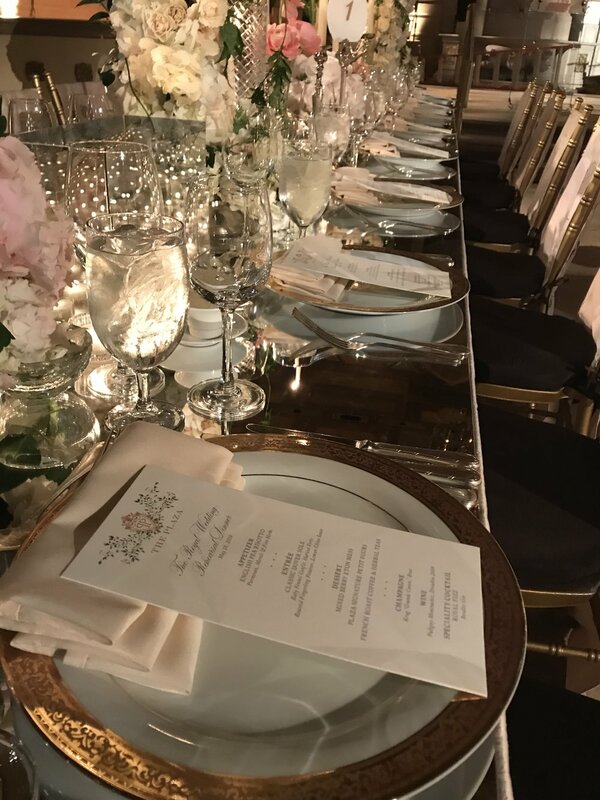 Soon the guests made their way down to The Terrace Room where the super chic and talented Jung Lee of Fete had designed a gorgeous dinner perfectly fit for royalty! Large candelabras were overflowing with stunning roses and peonies! It’s was dreamy and romantic! Alpine Creative who designed the invitations for the whole event has also printed the menu cards with these same beautiful flowers incorporated into the design. Our own Chef Geoff Rudaw has created a perfectly British menu that included Dover Sole as the entree! As Guests sat down for dinner they were in awe of the Room and the beautiful classical music prepared by Michael Hart of Hank Lane! Soon Rachel Jo Silver of Love Stories TV introduced herself as the Toast Master of the evening. We had invited 10 "celebrities" in the wedding industry to give toasts on their thoughts about different aspects of The Royal Wedding. There were lots of laughs as Marcy Blum wedding planner extraordinaire, Ron Ben Israel wedding cake designer to the starts, The Plaza's own etiquette expert Myka Meier, and of course the creative Jung Lee wedding and event designer! Each one spoke on what to expect and Meghan and Harry's royal nuptials the next morning! After each toast we all raised a glass in the royal couples honor and sipped our delicious Krug champagne. As the last and final toast of the evening by our very own Director of Catering, Mike Warren was wrapping up, Mike introduced a super star performance! Lights dimmed and Sir Elton John (or so we thought) started singing from a Grand Piano! As he belted "Tiny Dancer" the guests started to realize that Sir Elton wasn't really here but his impersonator couldn't have been better! As the night came to a close guests picked up their Royal Portraits and headed to bed because we all had a very very early morning the next day. The next day the alarm went off at 5 AM! I arrived to the Palm Court at 6 AM for The Royal Wedding Viewing party! There were dozen's of mainly women and lots of little girls who were all dressed up with fascinators in tow! Our Plaza Team was lucky enough to be wearing couture fascinators by Monvieve in an assortment of colors! Good Morning America covered the party and Brides Magazine gave an honor to the best dressed at the event. The crowd went wild went the first vision of Meghan in her Givenchy gown emerging from her car appeared on the extra large screen that had been installed in The Palm Court for the special occasion. The crowd loved it and we were so pleased to have The Plaza feel like the best place in New York City for everyone to feel like Royalty even if just for a day!